CHARLOTTE, N.C. -- The Federal Energy Regulatory Commission (FERC) has issued a new 30-year operating license for Duke Energy's Keowee-Toxaway Hydroelectric Project, which will allow the company to continue operating the Jocassee Pumped Storage Hydro Station, Keowee Hydro Station and associated lakes. "The project provides clean, renewable hydroelectric power generation, supports regional public drinking water needs and provides high-quality recreational opportunities for the region," said Steve Jester, Duke Energy's vice president of water strategy, hydro licensing and lake services. "This license ensures the availability of these resources for future generations." The Keowee-Toxaway Hydroelectric Project begins with Lake Jocassee in North Carolina and South Carolina. It flows into Lake Keowee then downstream to the Army Corps of Engineers' Lake Hartwell Project. 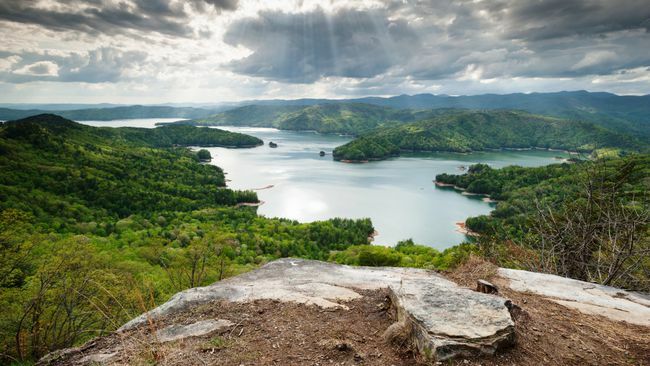 The Keowee-Toxaway project is made up of two reservoirs with two powerhouses, spans approximately 25 river miles and encompasses approximately 480 miles of shoreline. It provides 868 megawatts of hydropower generation and cooling water for Oconee Nuclear Station, which has the capacity to generate approximately 2,500 megawatts of energy. The new license takes effect Sept. 1, 2016, and represents a culmination of nearly a decade of collaboration among governmental and community stakeholders. "Receiving the license allows us to implement operational, environmental and recreational resource enhancements that will result in many benefits to the community and the environment for decades to come," Jester said. These benefits include improvements to existing public recreational areas on Lake Jocassee and Lake Keowee. The company will also implement a Habitat Enhancement Program in the watershed and conserve approximately 2,900 acres of property adjoining the lakes to preserve and protect ecologically and culturally significant resources. The project was originally licensed in 1966 for 50 years. Duke Energy filed the application to relicense the project in August 2014. The license application evaluated the impacts of Duke Energy's operation during the next license term and includes a relicensing agreement signed by Duke Energy and 16 other stakeholder organizations. It also includes a new operating agreement Duke Energy negotiated with the Army Corps of Engineers and the Southeastern Power Administration to improve operational coordination between Duke Energy's project and Army Corps of Engineers' projects downstream. Duke Energy will carefully review the terms and conditions of the new license during the 30-day review period and file any items requiring clarification or rehearing with the FERC. For more information about Duke Energy-managed lakes and recreational resources, including relicensing, go to: http://www.duke-energy.com/lakes.